Gamelyn Games is a publisher that I have a great deal of respect for. While many publishers are trying to prove that bigger is better, they have found the ability to break down a game to its most basic parts. While this may sound simplistic, the games still provide a rich experience, but they take a fraction of the time to set up and play. Not only that, but their boxes are very portable and affordable. Gamelyn Games has announced that Tiny Epic Kingdoms, the latest brainchild from Scott Almes, has now been posted on Kickstarter. Each player starts with a unique faction, a small territory, and a technology tree to grant them unique faction-specific magical abilities as the game progresses. Players will collect resources, explore other territories, battle each other, research magic, and work to build a great tower to protect their realm. The final round of the game is triggered when a player maxes out either their Magic Level, Population, or Tower. 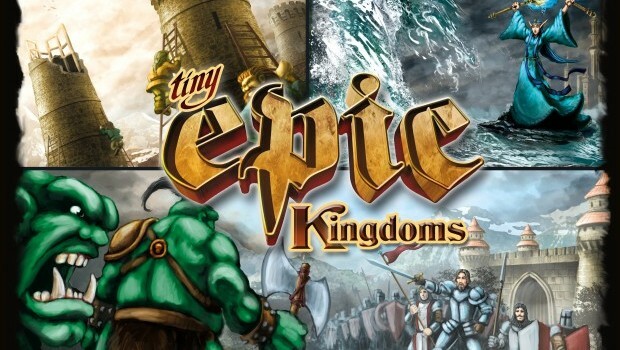 Tiny Epic Kingdoms is a 4X game that supports 2-4 players and plays in 30-60 minutes. The game has been up for a day and it’s already fully funded, along with several stretch goals. For a $16 game, that’s incredibly impressive. Seriously, check out the Tiny Epic Kingdoms Kickstarter page and check it out.